Below are a few of the Posters and Publications that have been presented by the DK-12 staff over the years. Poster for the Summer 2009 RET Program. 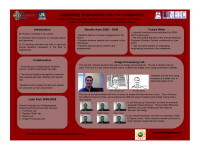 Mr. Konstantopoulos revised the image processing lab to teach during the 2009-2010 school year. 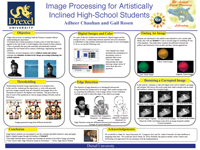 Poster that was presented during Drexel University's Research Day in April of 2008. Poster includeds a brief description of the Edge Detection and Image Processing Laboratories that were used in the CAPA classrooms. 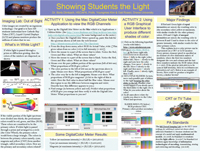 Poster made by CAPA High School teacher Dr. Boris Dirnbach, poster displays the research that done was on light while participating in the Drexel Research Experiences for Teacher Program at Drexel University during July and August of 2008. 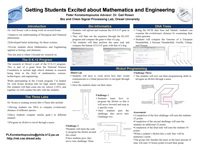 Poster Made by CAPA High School teacher Peter Konstantopolus, poster includes the research that was done on the DK-12 based laboratories for the CAPA students including Robotics and Bioinformatics laboratories.